When the first of the month falls on a Monday, it’s a great time for second chances. How are you doing with your New Year resolutions? I’ve struggled with cutting down on carbs, so since Christmas, I’ve been busy losing three pounds in weight, then putting two of them back on again. It’s the little things I miss. OH brought a still-warm loaf of wholegrain bread back from our village shop one day last week. I managed to resist it for a whole day, but my willpower failed before the family managed to eat it all. Bread and Marmite has never tasted so good! The second of February is Candlemas Day, a Christian celebration celebrated annually. It represents the Virgin Mary's purification and the presentation of Christ, and in our church all the candles for the year are blessed. 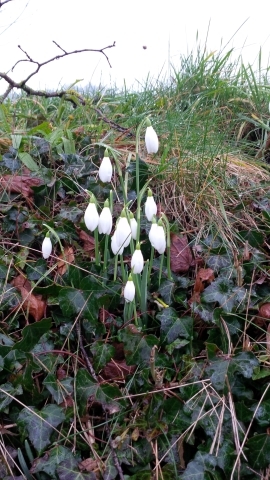 Snowdrops are traditionally known as Candlemas Bells, as they flower at this time of year. When some brave daffodils were in flower at Christmas here, I thought the snowdrops would all be out and over by now, but they followed their own calendar. The photos on this blog were taken here at Tottering Towers, but if you’re anywhere near Colesbourne in Gloucestershire over the next couple of weeks, try and get to Colesbourne Gardens, where you can see them by the thousand. The gardens are signposted from the M5, and opening times for this don't-blink-or-you'll miss it event are on their website.